A transistor by default has three terminals. They are called emitter, base and collector. We need to connect two batteries one at the input level and the other at the output level. Both these batteries will have positive and negative terminals therefore they demands altogether four terminals from a transistor to be connected. But anyway the transistor is having only three terminals. As a result we have to use one terminal as a common terminal for both input and output batteries. Depending on which of terminals that we are going to use as a common terminal we can say a transistor can be broadly connected in three possible ways. They are common base configuration, common collector configuration as well as the common emitter configuration. Among all these consultations common emitter configuration is a productive way of connecting because the input current that you’re giving is the base and output current that you’re getting is collector. 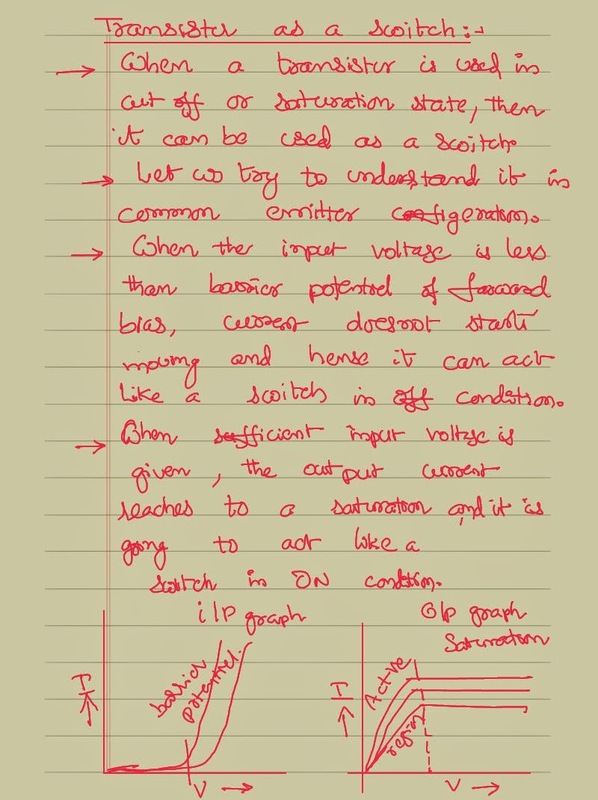 In any case the output current is much more than that of the input current therefore we are going to get a automatic current amplification when we use a transistor in a common emitter configuration. It is not only the current, the voltage as well as the power is also going to gain when a transistor is connected in a common emitter configuration. So a transistor in a common emitter configuration by default acts like an amplifier. When a transistor is connected in a common base configuration the input current is the emitter current and output current is the collector current. Here the amplification factor in this case is the collector currents ratio to the emitter current ratio which is always less than that of one. 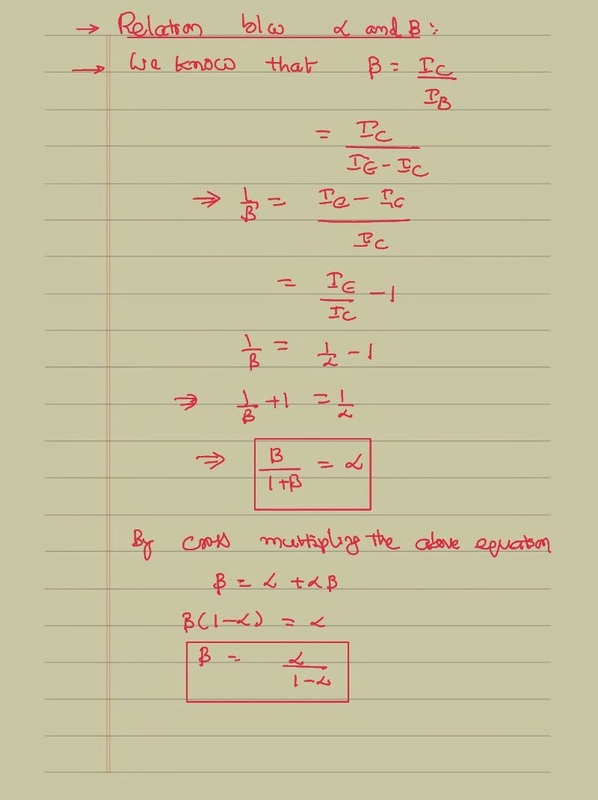 In the case of a common emitter configuration the amplification factor is the ratio of the collector current to that of the base current which is always going to be greater than that of one. We can find the relation between the current amplification factors of both common base configuration and the common emitter configuration as shown below. In some problems people may not specify that whether it is connected in a common base or common emitter configuration but we can easily identify by looking at the value of the current amplification factor. When the current amplification factor is less than one which can identify it as a common base configuration and when it is greater than one we can identify it as a common emitter configuration and they need not to be exclusively mentioned in a problem. 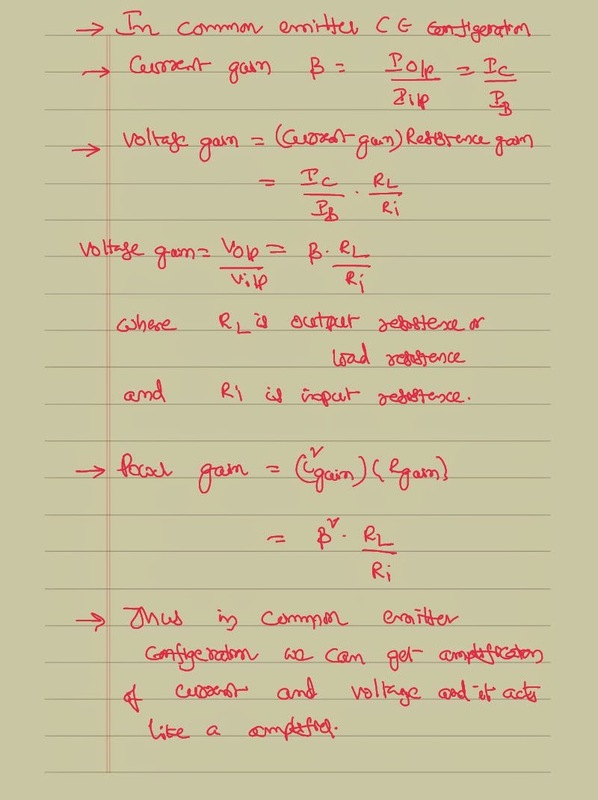 Once if you know how the current is going to be amplified in a common emitter configuration correspondingly we can calculate the voltage gain as the ratio of the output voltage to the input voltage. We can also calculate the power gain as the ratio of the output power to that of the input power and the corresponding values in common emitter configuration as shown below. The transistor can be simply user like a on and off switch. To know how this is going to happen we shall know the basic characteristic properties of the transistor. When the voltage applied at the input level of a transistor is less than that of the barrier potential it we were never able to pass the current through the circuit therefore during this range though you are applying the voltage there is no current that could be seen at the output level and it is simply acting like a switch in the off mode. When the transistors output voltage has reached a certain region called as saturation region, even with the increase of the applied voltage, the current is not going to increase because of the limited availability of the charges.Hence the current through the circuit is going to remain constant consistently and this part of the circuit can be reserved like a switch in the on mode.